Mandala is the Sanskrit word for circle. Mandalas often have radiating patterns and can be found in nature; a good example is tree rings. 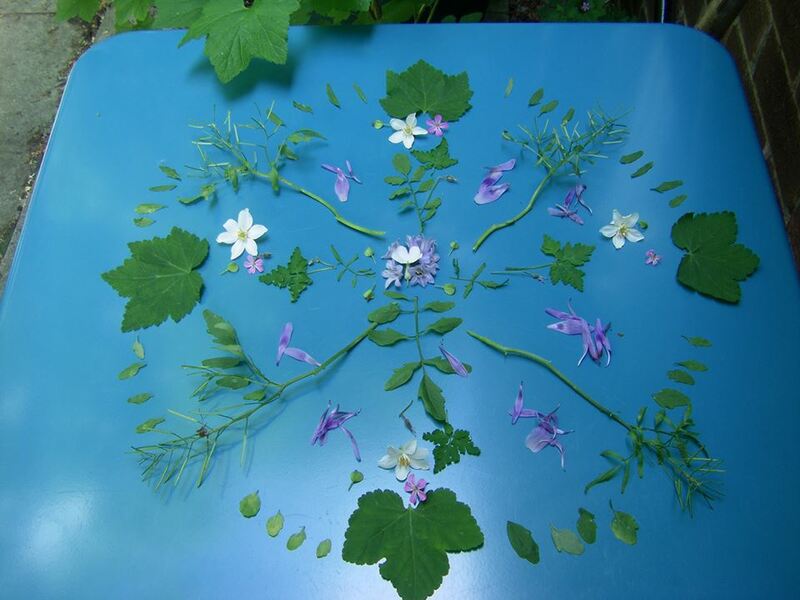 Our stress-busting nature mandala events allow everyone to join in with this creative yet tranquil activity. The patterns can be simple or complex. 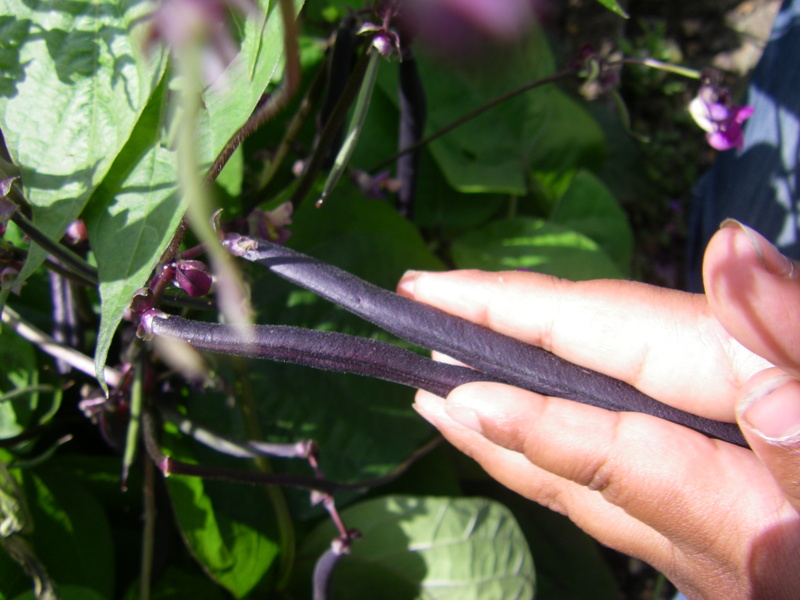 We use natural materials or, as part of our healthy eating projects, plant-based food items. 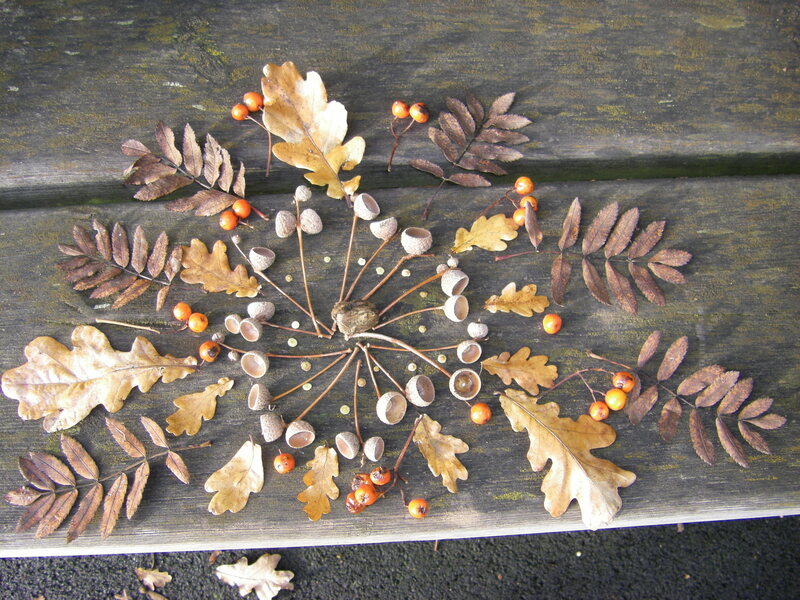 Would you like to join us to make huge mandalas with piles of apples as part of our orchard projects? Food Growing and Heritage Plants: project overview. 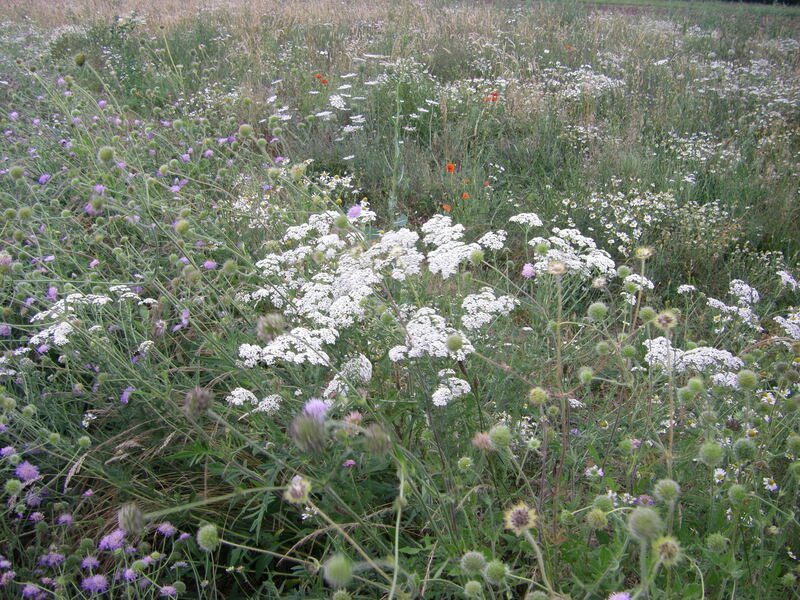 Above, fields of British wildflowers in the East Midlands. 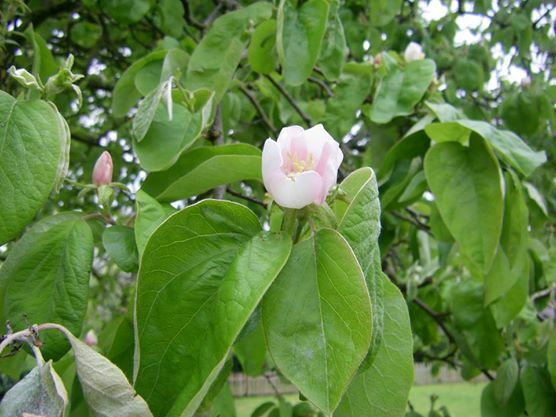 Our heritage plants projects include ancient trees, traditional orchards, heirloom vegetable growing and seed saving as part of a sustainable plant-based diet, and wild plants and flowers. 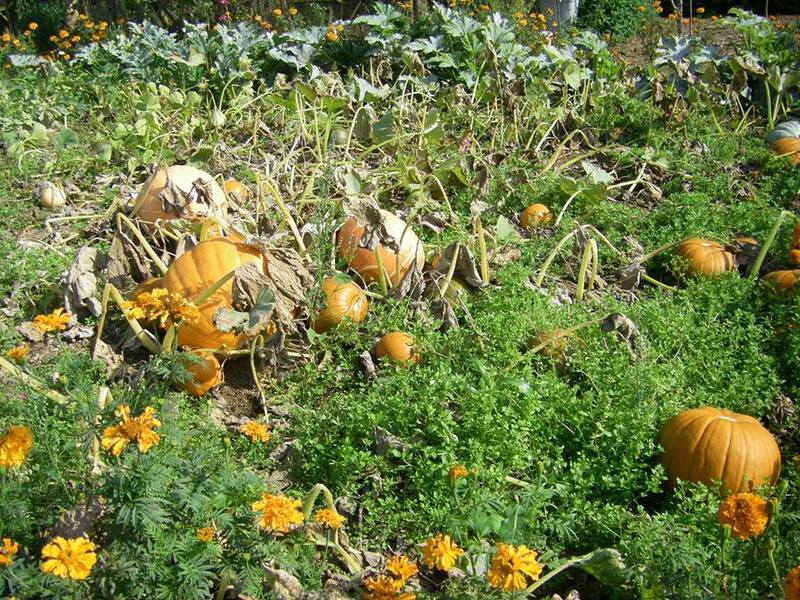 Below: child feeling heritage French beans, pumpkin bed and traditional orchard medlar fruit. 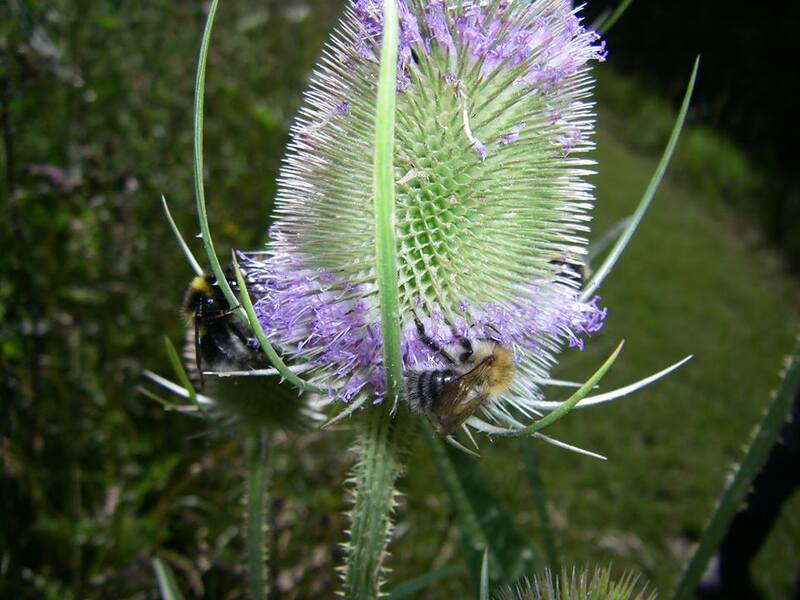 We raise awareness of the importance of open pollinated plants and the need to create a healthy environment for pollinating insects. 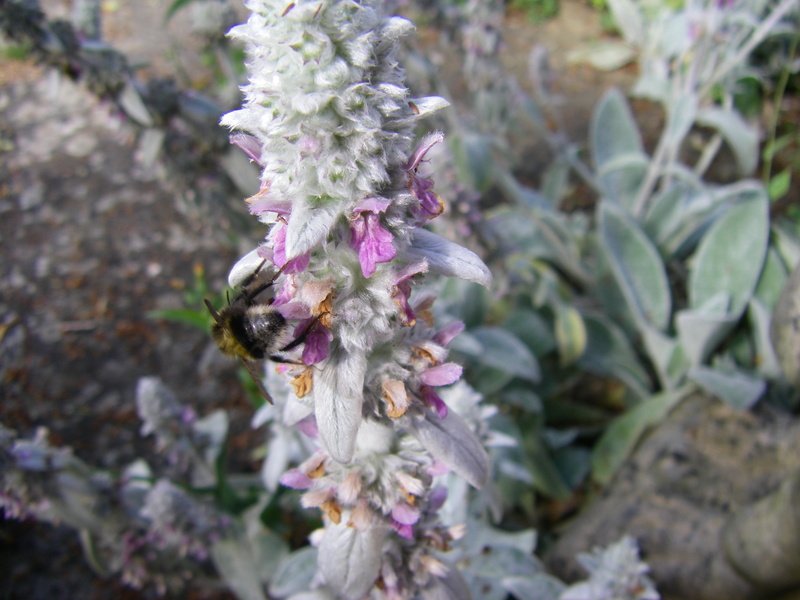 Below insect pollinated heritage garden plants. 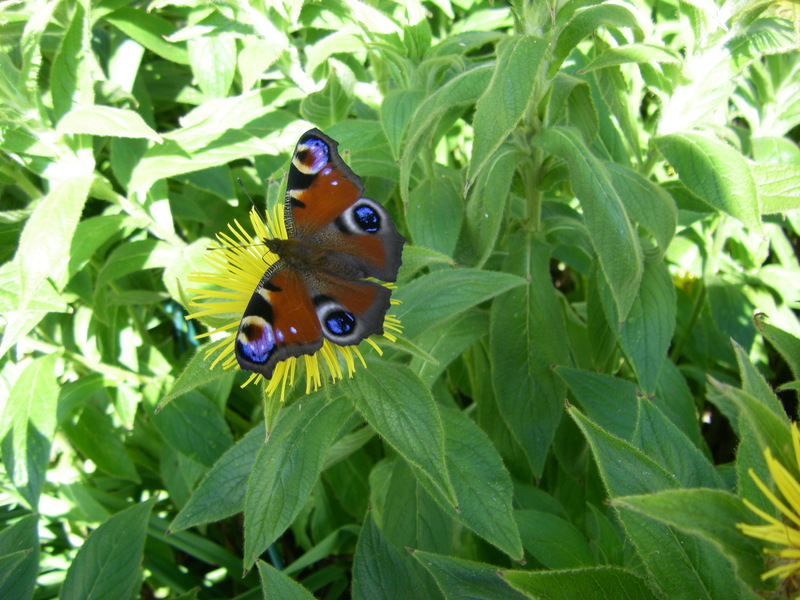 Our volunteers carried out a butterfly count and monitored bees and spiders during this years national insect week. Photographs shown here are by volunteers and supporters. 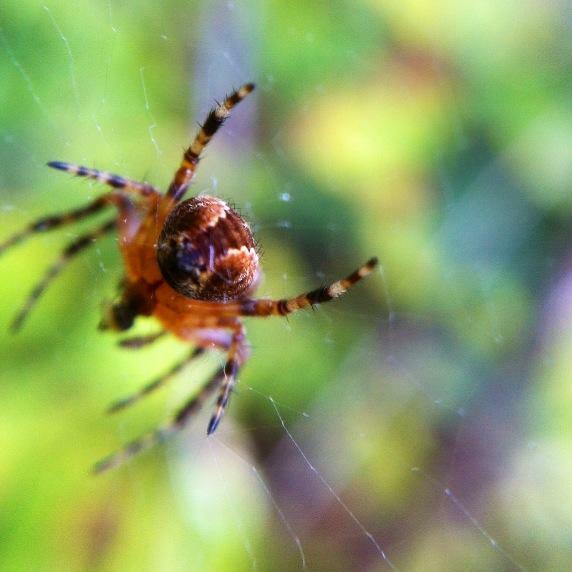 Below: spider by our supporter Christina Cudworth Franson. This year monitoring took place in Nottinghamshire, Doncaster, Lincolnshire and Leicestershire. Our records have been submitted to Nottinghamshire Geological and Biological Records Office for many years. This year we have designed a new volunteer species monitoring form and our volunteers are interested in linking in with East Midlands iSpot based at Nottingham University. 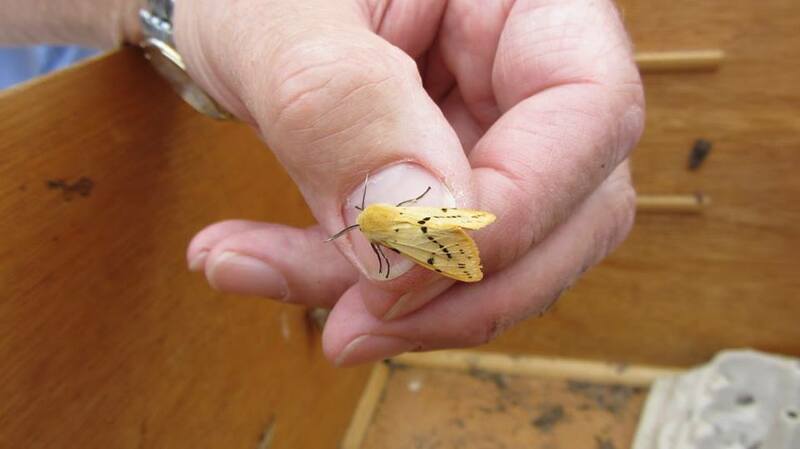 Warren Priest is looking for help in identifying 400 species of beautiful moths. 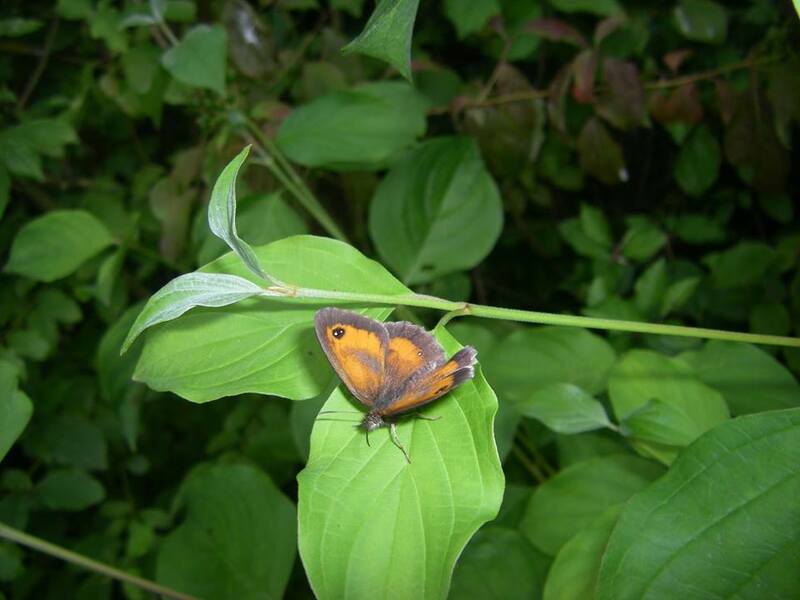 Warren photographed the moths in Sikkim Province India. A link to Warren’s photographs can be found in our links section. If you can help, please contact us in the first instance. Making dead-wood piles for insect habitats, is always a popular activity with our volunteers. Our volunteers made daily photographic records of this wild bee colony in the run-up to National Insect week 2013, posting it on twitter at the start of the week. We planted native pollen & nectar plants. The nations starving bees can not fend of virus attack and are weak in the face of agri-chemical poisoning. 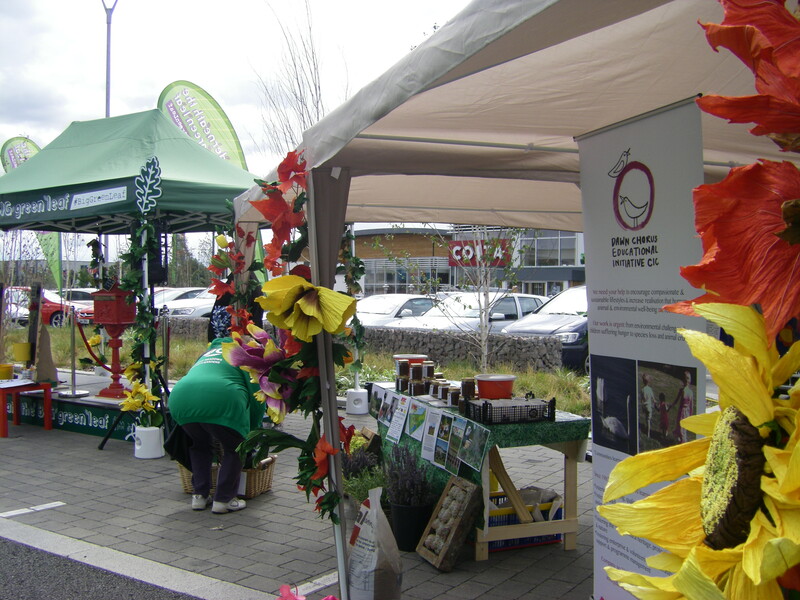 Our publicity campaign during the week asked supporters to plant for bees & butterflies and be organic gardeners. What people are saying about us: “Dawn Chorus Educational Initiative is an absolute authority on engaging people on urgent issues that matter. 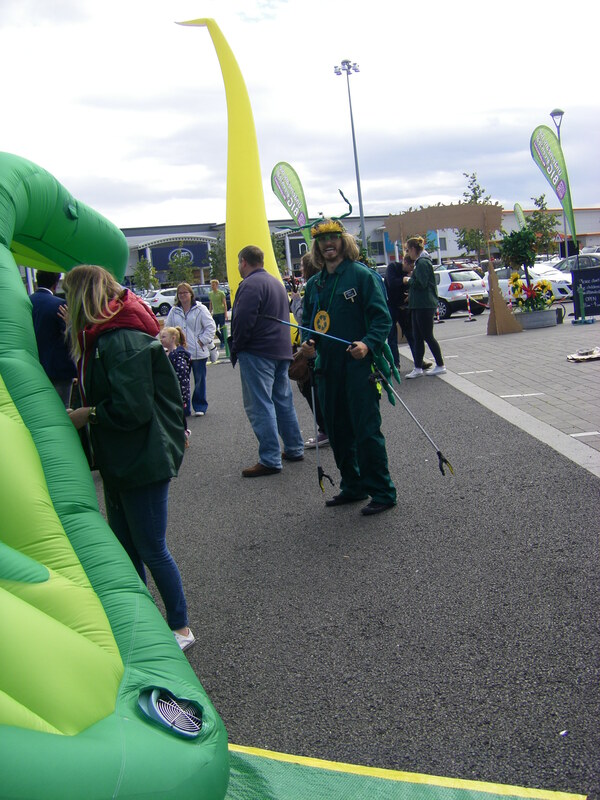 The influential community education programmes, led by this Community Interest Company, make a real difference to the lives of people who are welcomed and encouraged to participate in admirably passionate activities that celebrate our heritage in style and offer high rewards to animals and the environment”, Sarah B., supporter. “Through the encouragement of behavioral change and by offering people opportunities to learn skills and get involved in making hands on practical contributions, Dawn Chorus is making a lasting, positive impact on social, environmental and animal welfare in our local communities. 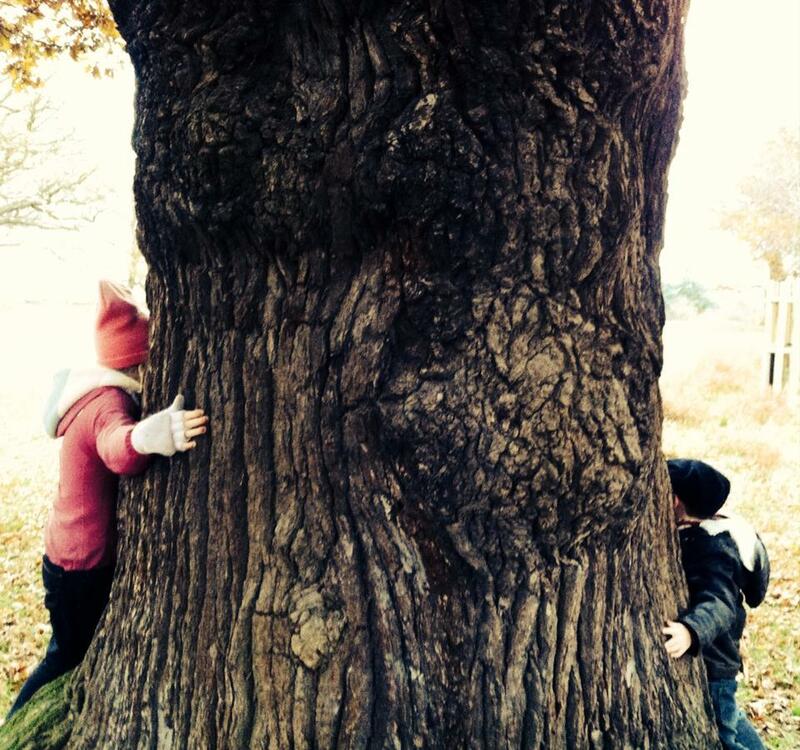 The activities build self confidence and personal satisfaction, drawing on the calming tranquility of nature, the arts and respect for each other and for animals, whilst growing understanding and appreciation of horticulture, wildlife, landscape conservation, culture and heritage”, E. Barley, supporter. Each year Dawn Chorus thanks our volunteers by holding a volunteers Valentine snowdrop walk. 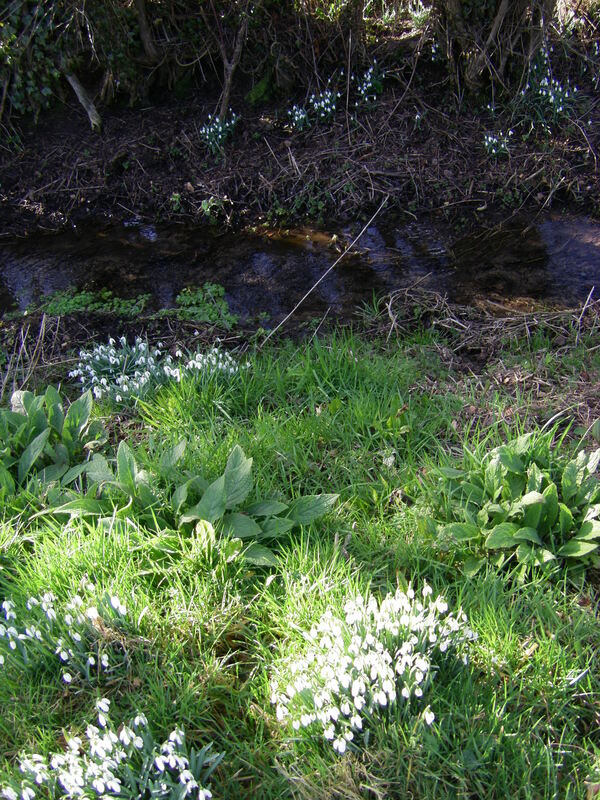 Previous popular walks when our volunteers have been blessed with glorious sunshine and fabulous displaies of snowdrops, have taken place in Lambley, Stansted, Lincoln Epperstone. The walks end with visits to local churches and refreshments. In 2015, glossy ibis, lesser spotted woodpecker & a little owl were spotted in same field at same time by Dawn Chorus volunteers on the volunteers valentine snowdrop walk, well done volunteers of all ages. Dawn Chorus Educational Initiative works in the community and has built social capital which can be drawn on at times, such as now, when economic capital is short. Our studies demonstrate that our contribution to building social & voluntary capital makes the community more resilient and self-starting, directly addressing social issues and having economic value; feeding into the local economy. What you can do to help: Bake off: can you bake a few cakes, sell them to your friends & forward the money to our good causes…then sit back and take all the praise for your great baking? Cup cakes & cookies? Yes Please! Help us as we strive to enrich lives, foster enterprise and build communities. From the Nottinghamshire coalfields to orphanages in the poorest countries of Africa, you can make a huge difference by helping people to gain skills and learn about well-being, food growing, sustainability, the natural environment, animal welfare, arts, crafts and cultural heritage. COZY KITCHEN: Dawn Chorus volunteers have been running Cozy Kitchen since 1992. 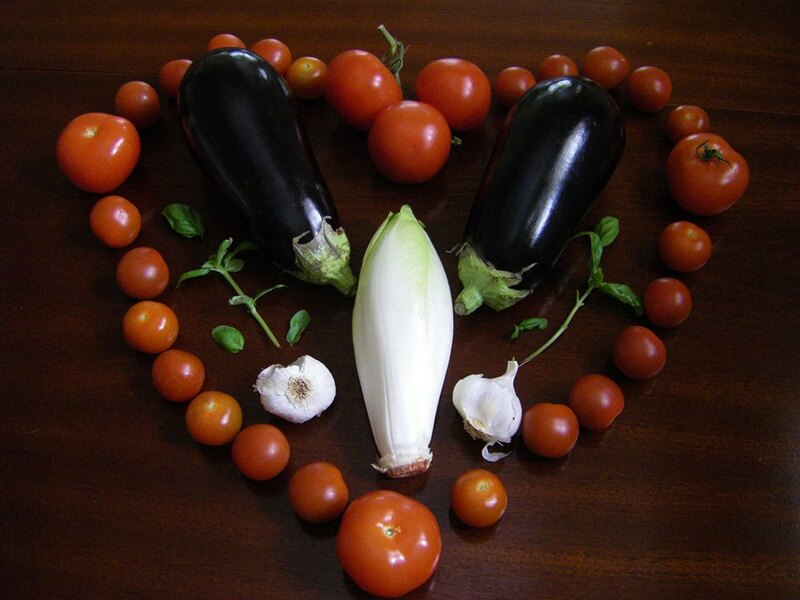 It is a virtual place for friends to share vegan recipes and chat about volunteering. Many popular recipes have been shared over the years and are often on our Facebook page by popular request, such as our Dandelion Fizz, traditionally made on St. Georges day. Your friends would love you to organise a bake sale or work place cake sale, to raise much-needed funds for Dawn Chorus good causes; we can send you leaflets to let your friends know about the good work that they will be supporting through eating a yummy cake! You could make the cake below, in a square tin and cut it into squares to sell to raise funds for our important work. 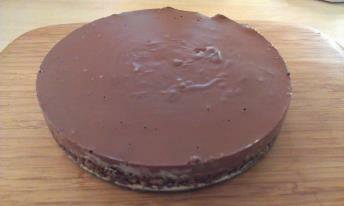 Find the recipe by following our link to “veganindulgence”, a blog by our supporter Andrew Jones. Ivy is one of our most valuable wildlife plants and our only evergreen native climbing shrub. 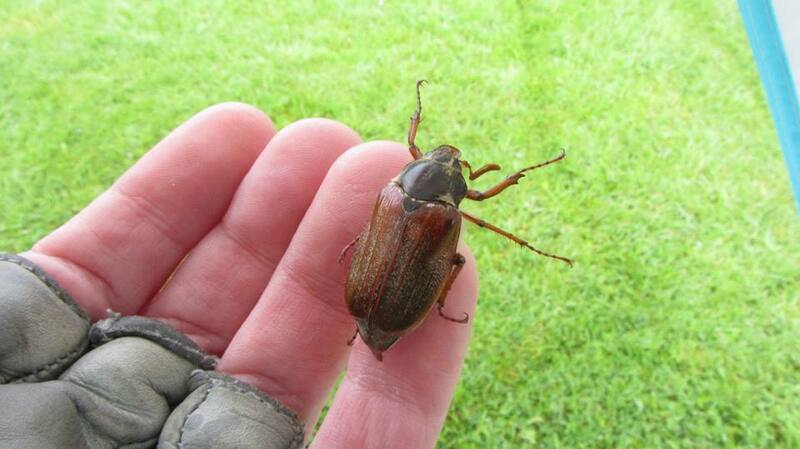 Given this, it is one of the species that we have chosen to target in our educational work. The only ivy native to the UK is Hedera helix. 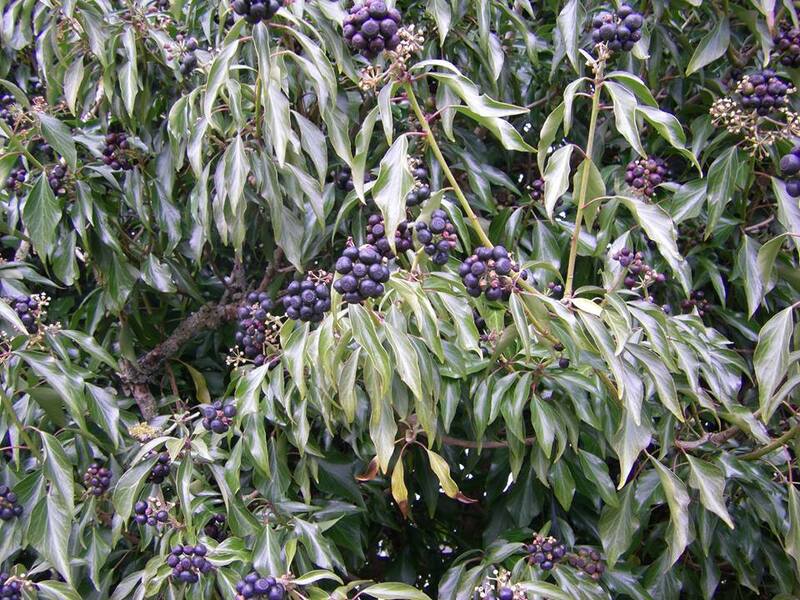 Only Hedera Helix has the full wildlife value as it bears flowers and berries which many of the cultivars do not. 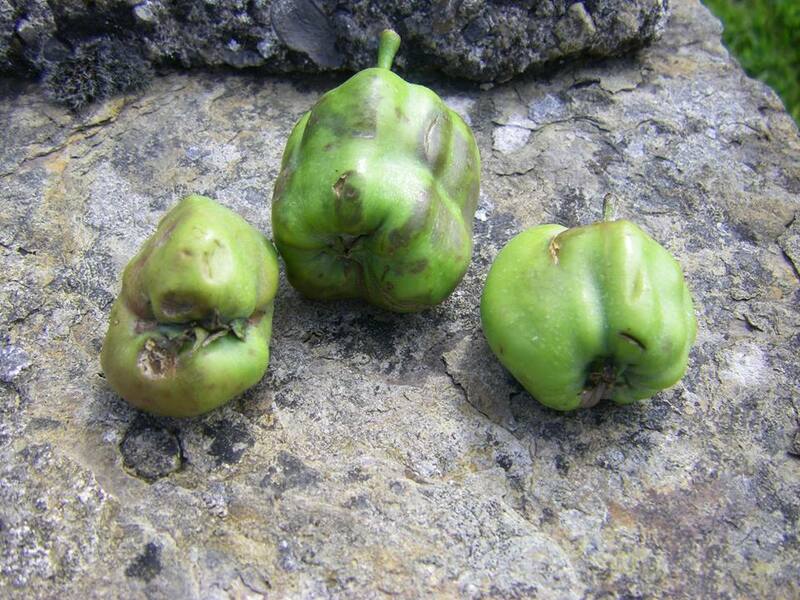 It has distinct juvenile and adult growth forms. It tolerates low light levels and a range of soils, favouring woodland where it provides good ground cover. In winter it benefits insects and small mammals by providing a foraging area for ground feeding birds such as thrushes and dunnocks. The dense vertical cover provides an ideal shelter and roost site for birds and bats such as the pipistrelle. Many species of bird such as wren, dunnock, blackbird and spotted flycatcher nest in ivy covered walls or trees. Several moth species depend on ivy as a larval food-plant and caterpillars of species such as the swallow-tailed moth, the old lady and the willow beauty can often be found feeding on the leaves. The holly blue butterfly is dependent on ivy as a food plant for its second generation caterpillars. 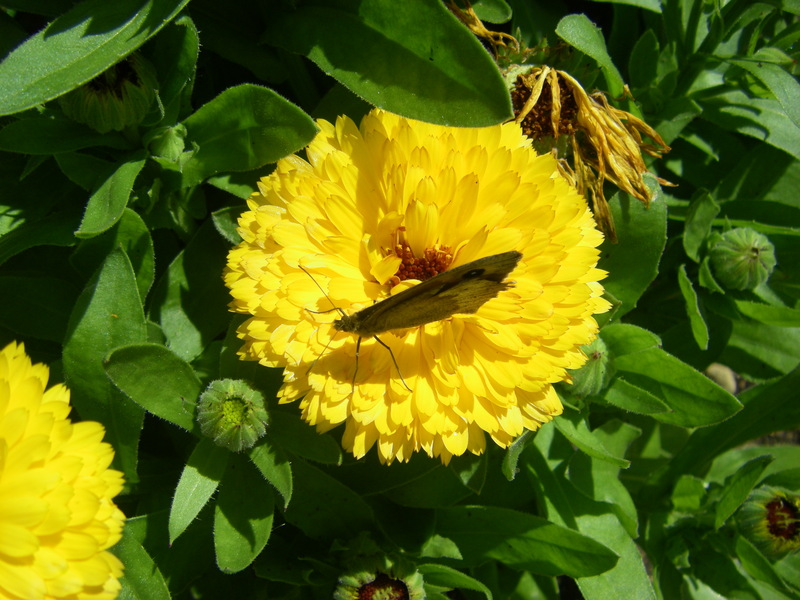 Many species of butterfly (including Red admiral), moth, hoverfly, green bottle, wasp and bee are attracted to fuel up for hibernation at the flowers. It provides a very rich late summer to autumn nectar food, when other nectar sources are scarce; indeed queen wasps depend on these December flowers. The berries are an important food source for birds, including blackbirds, woodpigeons, collared doves, robins and blackcaps as well as small mammals such as wood mice. Comma, Painted Lady, small tortoiseshell and brimstone butterflies hibernate in ivy. Ivy is not parasitic and draws sustenance through its earth roots, using the fibber fingers only to cling to non living, non vascular vertical bark surfaces. Indeed ivy becomes self supporting and can often retain its upright bush form after the death and decay of a tree, hence extending the valuable habitat. Ivy wood is strong yet flexible and has a forking characteristic; it has traditionally been used to make pitch forks. 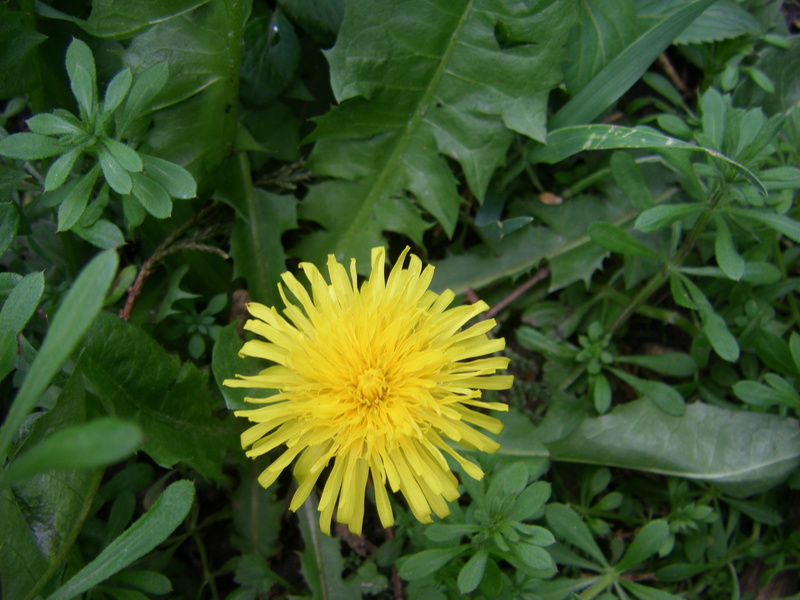 The plant has a range of folk uses. Ivy only climbs relatively mature trees and does not cause many problems. 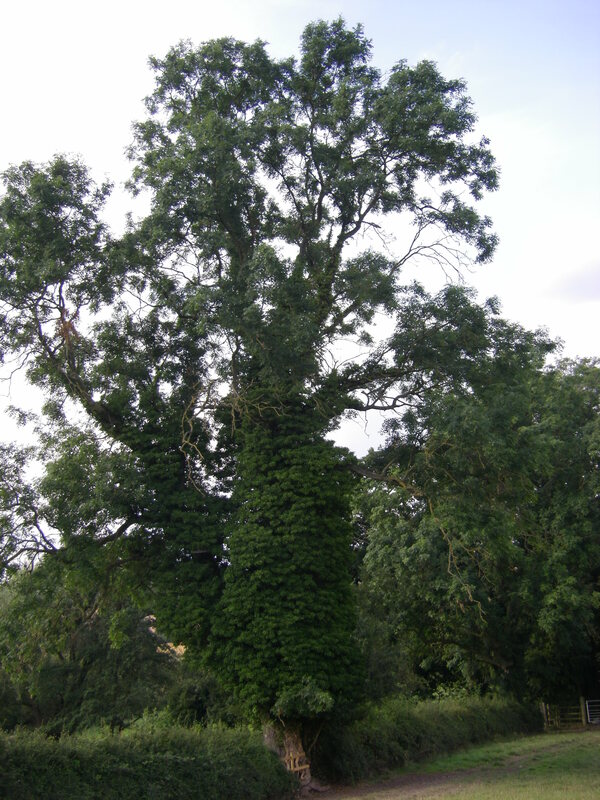 People often think that it is taking over a tree; however what is happening is that the tree may be old or have a fungal infection that is to blame for its reduced canopy and the ivy is taking advantage to fill the void and provide a new wildlife habitat. The spread of the plant in the crown of the tree can deprive the leaves in the tree canopy of sunlight. In the case of a dead or dying tree, it is possible that the wind could catch ivy and cause break out but more often ivy protects tree trunks by dissipating wind. In such cases strategic trimming of the ivy foliage can help (it is not all trimmed at once but the impact to wildlife is spread by rotating the areas trimmed over a number of years) but cutting the ivy stem is pointless, it will not reduce the foliage but will be unsightly and useless to wildlife. This work should be a last resort: avoid trimming during flowering and fruiting (berries stay on the bush between November and April), avoid bird nesting season (March-July) and get a professional bat survey as bat roosts are protected by law. Since 1985 Dawn Chorus and Juno Enterprise have built up a reputation for leading on orchard projects, prior to this board members piloted interest in orchards in Essex, the West Midlands and Nottinghamshire. We liaise with a number of national groups to facilitate orchard information and network opportunities regionally. Dawn Chorus organizes orchard activities as part of our “out to learn” opportunities. 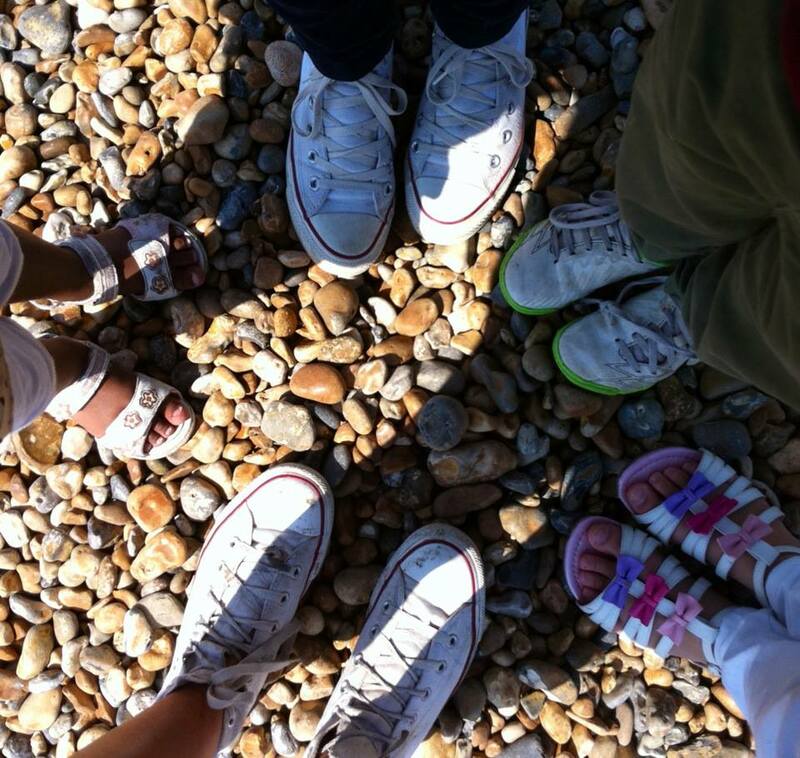 We develop new and innovative orchard projects with new groups in new locations. We encourage orchard habitat creation, promote the replanting of hedgerow fruit trees (such as damson, traditional in the county, which are under particular threat) and give advice on sensitive and sustainable land management, including traditional orchard restoration and recreation with local heritage varieties. Our volunteers survey orchard fauna and flora. Evaluate data to determine conservation priorities. We have “mapped routes to market”, stimulating demand for traditional orchard products. Community members and groups enjoy the historical and cultural activities associated with orchards, from regional wassailing to making huge apple mandalas. 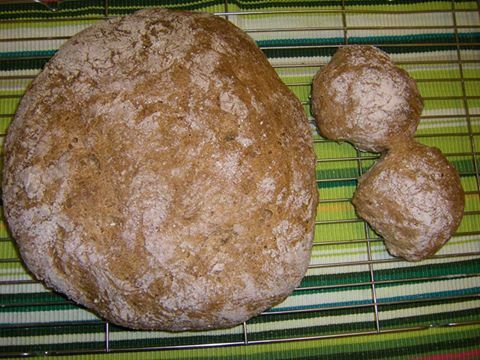 They learn to use wood and fruit in a range of ways such as our traditional apple bread, pictured below. Above: our 2015 “Be Healthy” Wassail. The old Staffordshire slip trailed mug is pressed into service every year. Barley wine is traditional for wassail in Nottinghamshire but Gregg’s Pit Herofordshire pear perry gives a very satisfying “pop” and is always popular with adults. 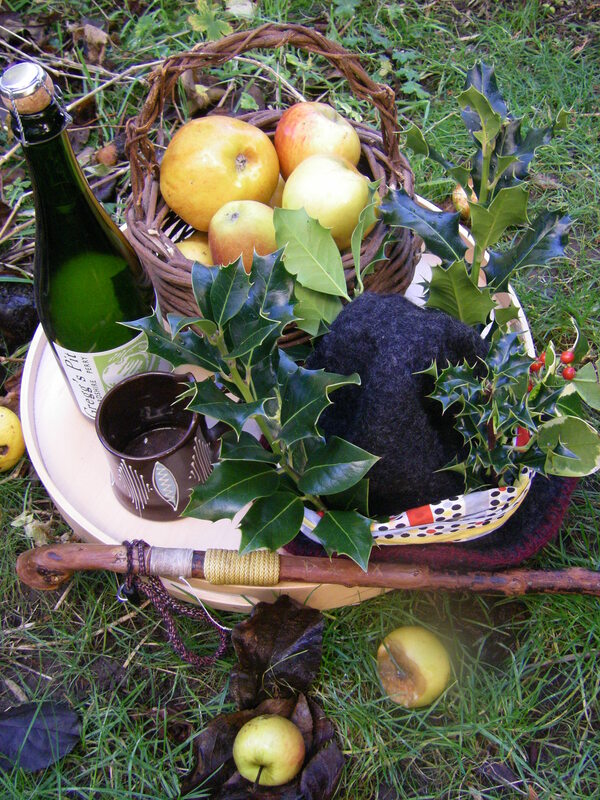 Apple juice and apple pies – our “pips to pies project”, are a hit with children who love to try on the Holly Kings hat. We encourage securement of heritage varieties, grafting and own root propagation methods. 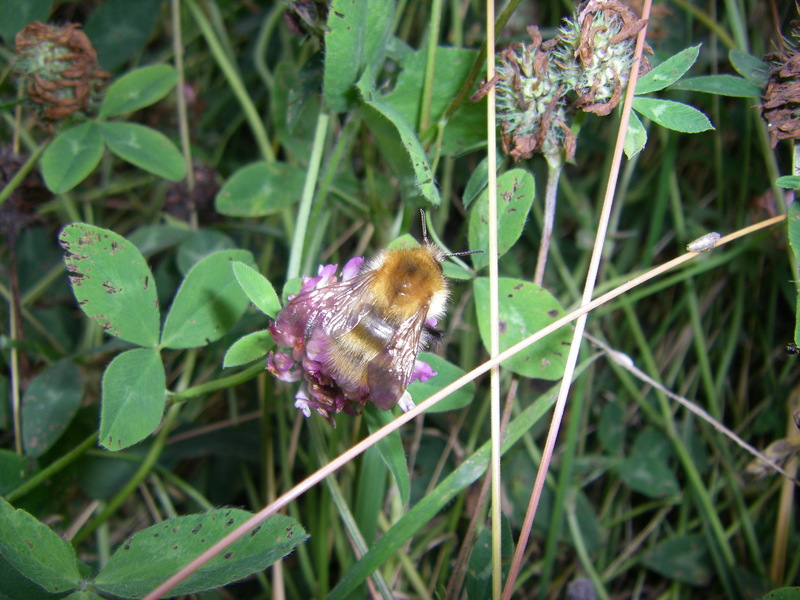 We carried out research with national bittersweet experts, via the Marches Group, into specific varieties. 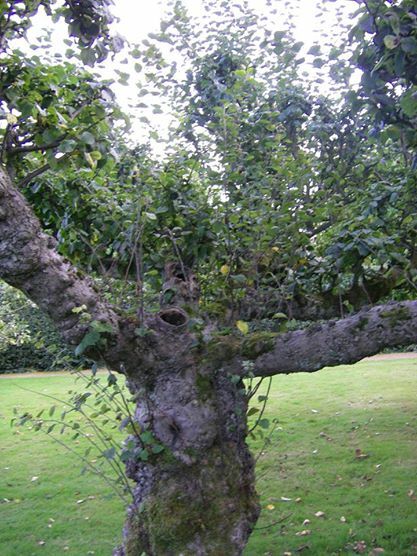 We carry out orchard mapping using historic maps and oral history projects to identify surviving and lost orchards and undertake fieldwork to establish condition, raise awareness of the wildlife and wider benefits of orchards. We are currently producing an orchard booklet. Orchards are a rich resource. 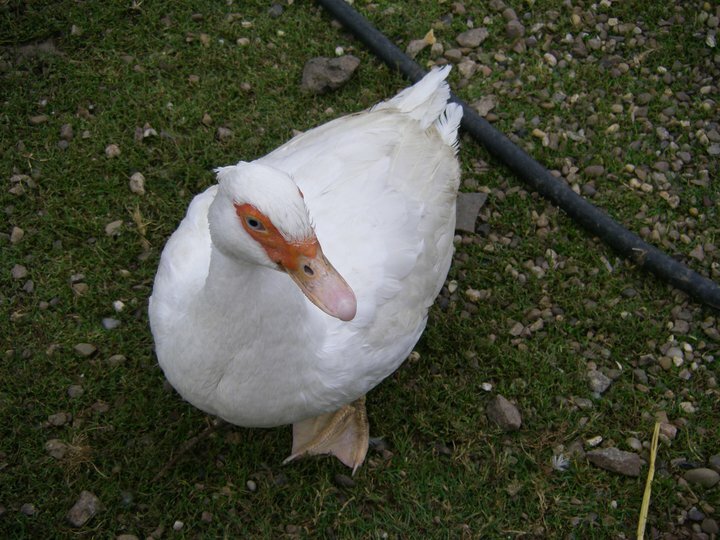 Villages such as Lambley in Nottinghamshire had a considerable number of orchards, growing fruit for market and some varieties were ready to supply stalls for the Goose Fair. Sadly, many orchards have been lost to the development of housing, road building, industry and golf courses. We see a lack of understanding of the cultural, environmental, health and wildlife significance of orchards.Traditional management, pruning skills and grass sward care are now rare and the special habitat that they provide are under threat. Old varieties give way to modern commercial bush varieties with heritage trees often grubbed up or are not replaced due to lack of economic incentive. Modern management practice such as clearing dead wood, using pesticides, fertilizers and herbicides and strimmers are detrimental. Heritage orchards may occupy the same land for centuries & with low chemical input can provide a biodiversity haven. 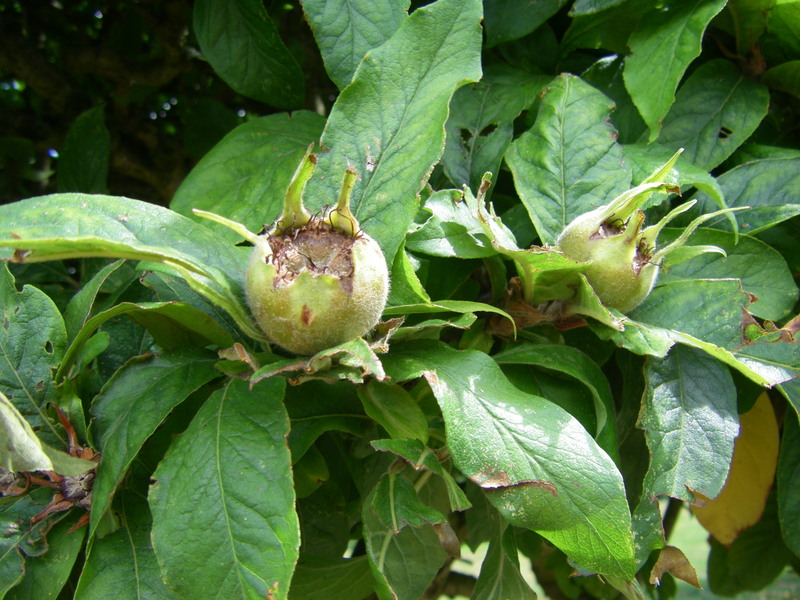 Fruit trees provide a long flowering and fruiting period, offering nectar and fruit for wildlife over the maximum periods of time. Blossom and windfalls provide nectar for bumblebees and butterflies, moths and other insects and autumn and winter food for mammals, insects, mollusks and birds, respectively. A neglected orchard may have become a rich wildlife site with a mosaic of habitats. Hedge boundaries, wood pasture features, varying vegetation, individual fruit trees, decaying wood, species rich grassland understory, nectar sources and water elements can all be important in providing food, shelter and breeding sites. 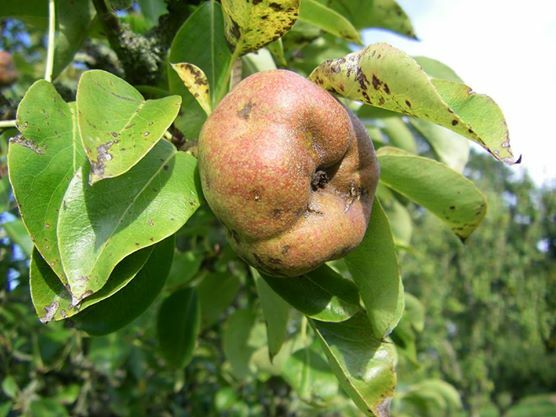 If you have old fruit trees that no longer produce fruit, have remedial pruning by a reputable specialist to rejuvenate. Retain trees that no longer fruit or are dead as a landscape and wildlife feature on your land as long as safe to do so, they provide bat roosts, help hole nesting birds and invertebrates. Fruit trees are relatively short-lived, consequently producing more dead wood habitat more quickly. Bark provides can an anchor for lichen, moss and epiphytes invertebrates; lichens growing on the trees are used by the Hook-tip moth. 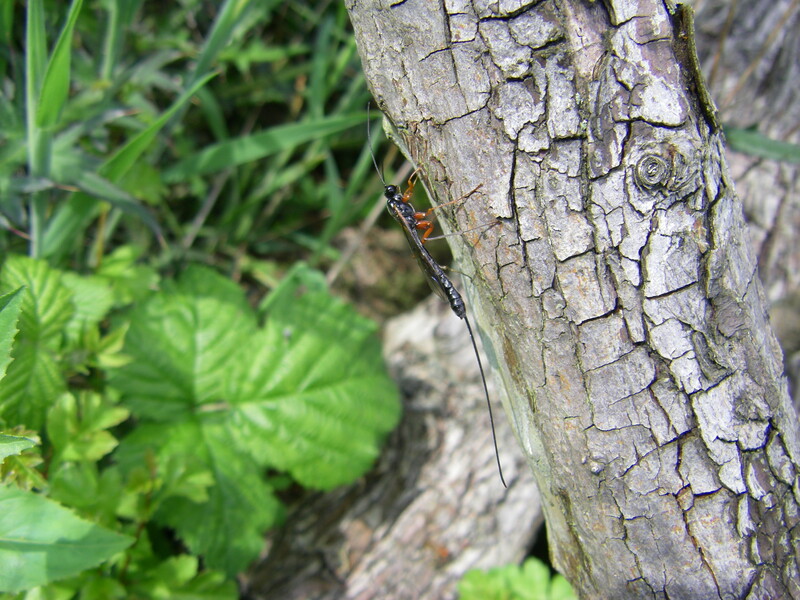 The Red-belted Clearwing moth lays it’s eggs on rough, cankered large apple and pear branches, the larvae then live under the bark. 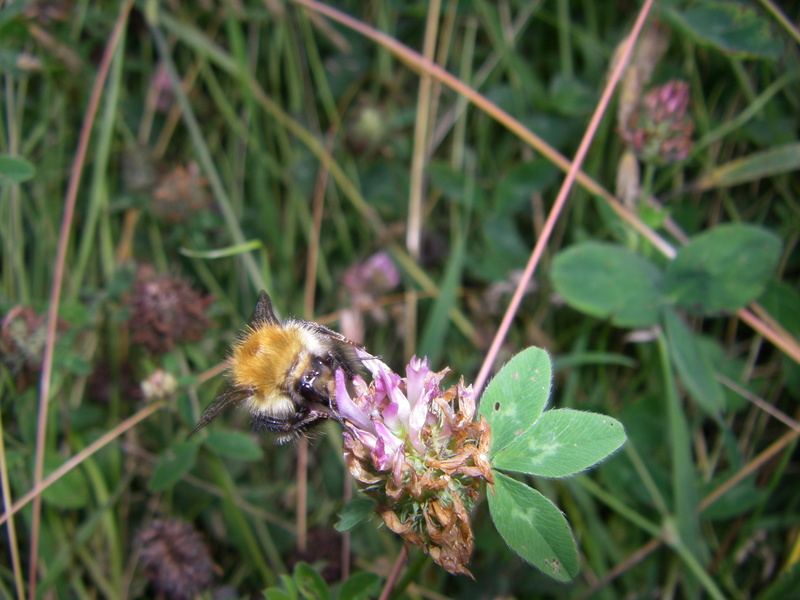 Hedges add greater biodiversity gain, extending nest sites and nectar sources. Mistletoe gives cover for insects and has its own weevil. 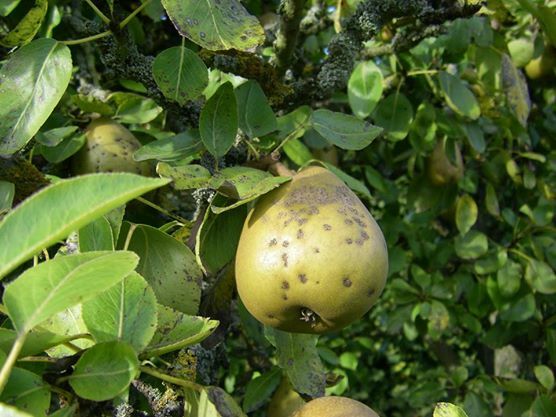 Apple trees support Eyed Hawk–moth larva; near-by willow and poplars would increase this month’s habitat. Orchard hedges are important to the Pinion-spotted Pug moth which may need apple and hawthorn to feed and complete its life cycle. Lunar-spotted Pinion moth will benefit from orchard hedges, where its larva can feed on elm, blackthorn and hawthorn as well as apple. 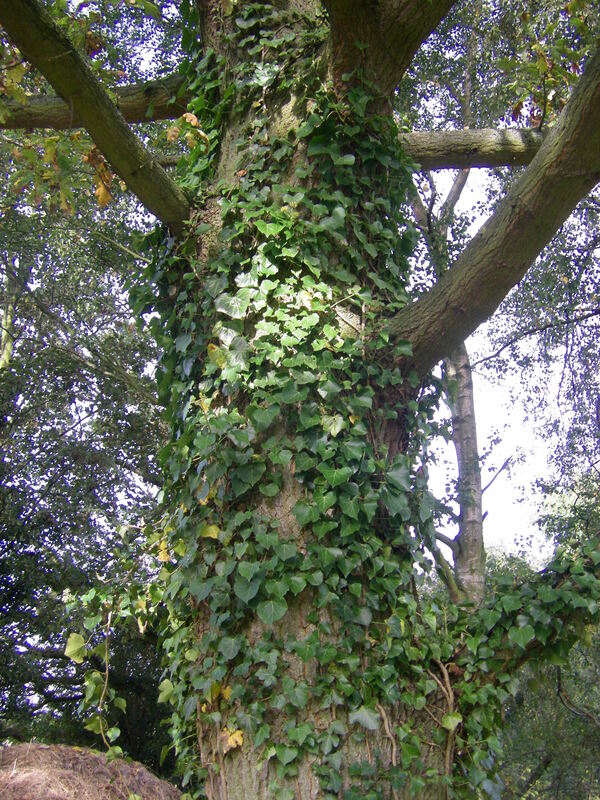 Ivy should be encouraged; it provides cover for insects and nesting birds and a late nectar source for insects and berries for birds such as black birds, song thrushes, mistle thrushes, Redwing, collared doves, robins, black caps and wood-pigeon. 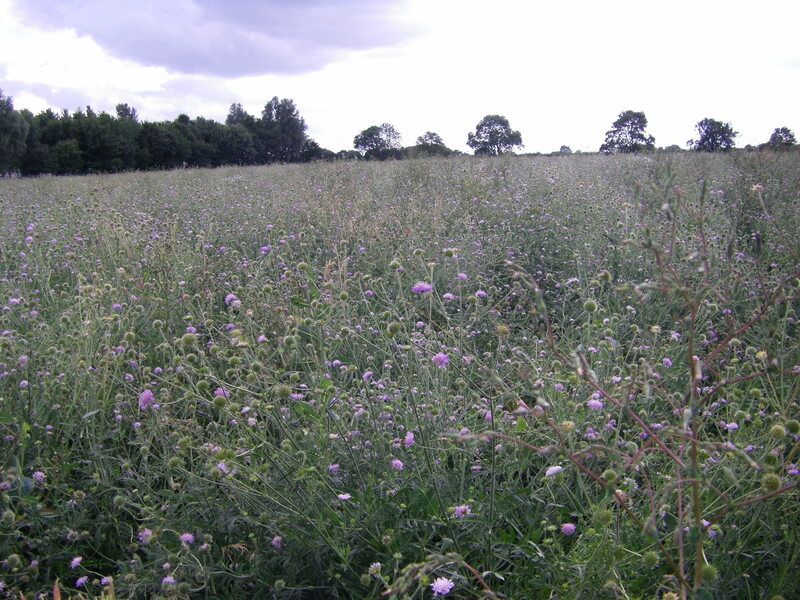 Grass sward should be cut for hay to encourage diverse flora and could contain a ponds for the wildlife. 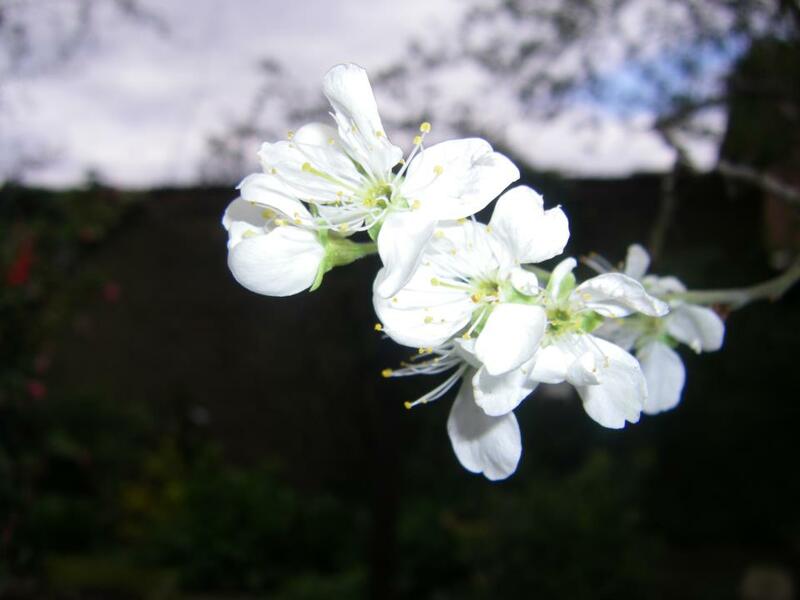 Above: blossom of the Merryweather Damson. 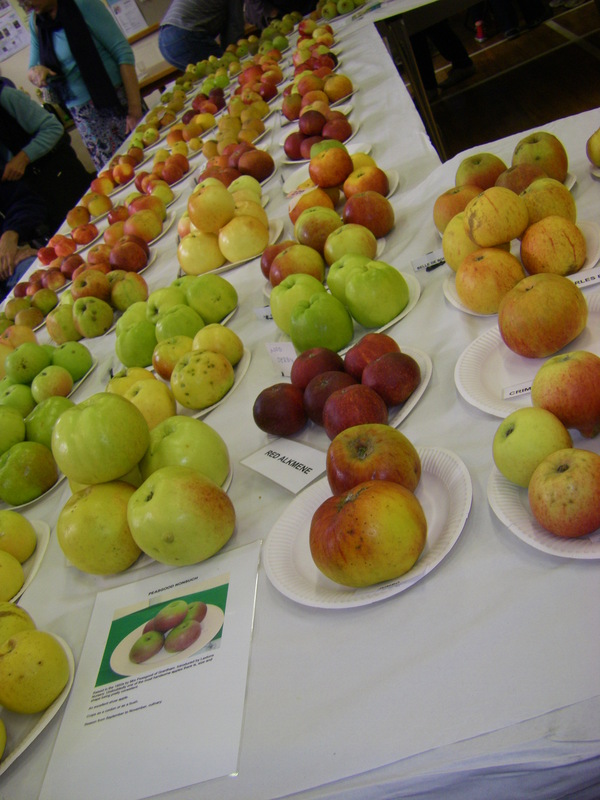 Nottinghamshire has a number of unique fruit varieties with a traditional local mix gene pool, suited to sustainable orchard habitat management. 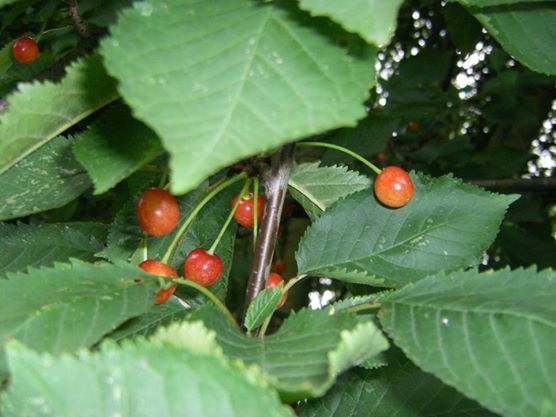 The synergy with local wildlife can be influenced by local wild fruit that gave rise to ancient cultivars. 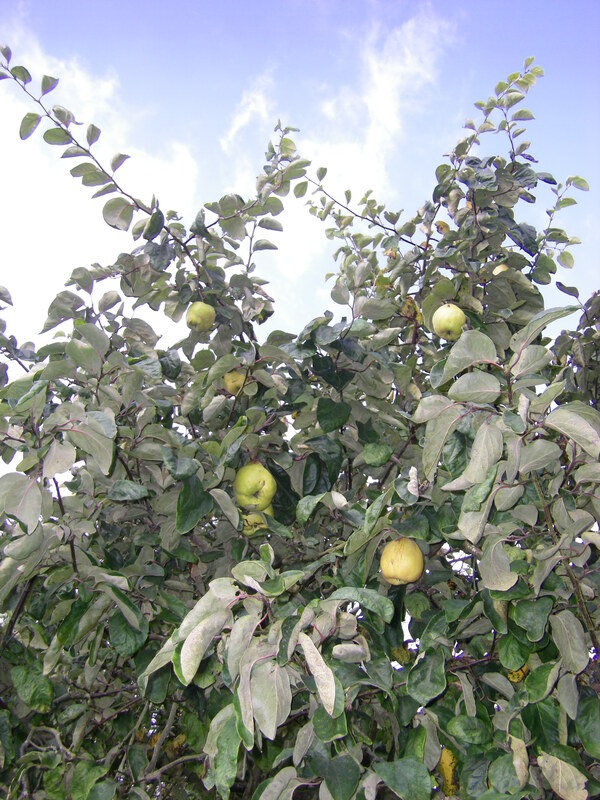 Crab apples were often planted at the centre of orchards to aid fertility. 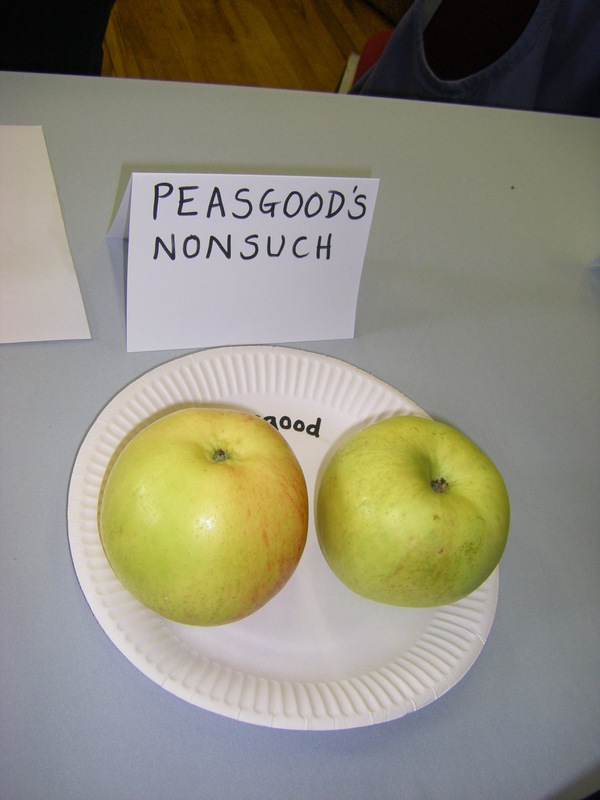 Buy locally grown orchard fruit to encourage orchard growers to extend stock. 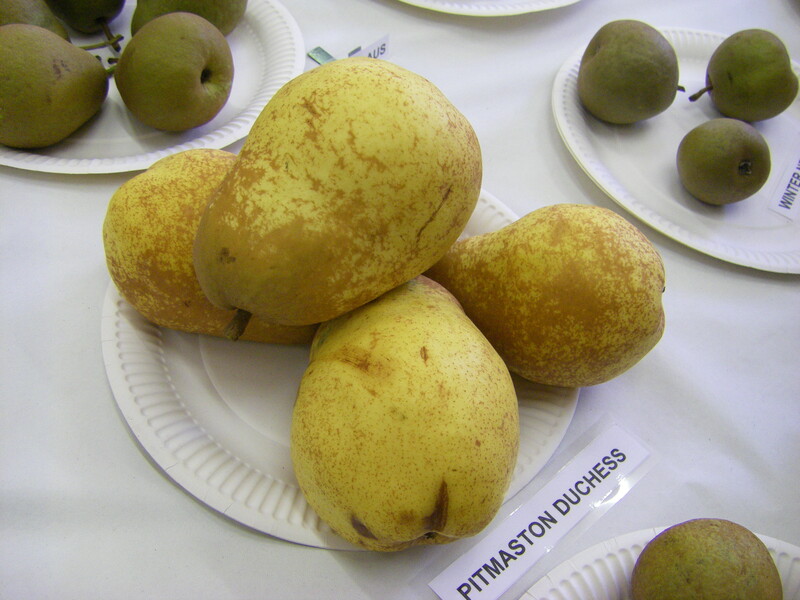 Below: Pitmaston Dutchess is a very big and most delicious, juicy pear. Orchards can be protected directly or indirectly in a number of ways: as trees, landscape features, or habitats with biodiversity value. 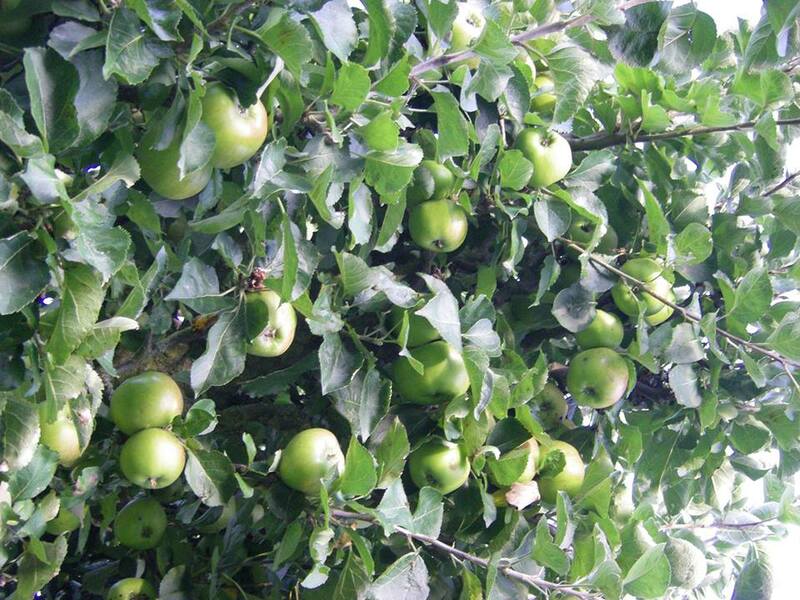 The 1999 Town and country planning act via TPO’s, can protect fruit trees, usually in urban areas, for amenity purposes. They can be applied to whole orchards or individual trees. Further, orchards can be designated under PPS9 Circular (para 88) if they benefit biodiversity and conservation. Wildlife associated with orchards, eg: invertebrates or the botanical grass land mix could offer protection to sites via designation. Consideration could be given to SSSI, Local Nature Reserve or County Wildlife Site potential. In the cases of semi natural or uncultivated (neglected) sites, with unimproved grass land, significant populations of BAP species, historic features or with specific landscape value, Environmental Impact Assessment (EIA) Regulations could provide protection. Larger orchards should be considered under forestry EIA regulations. 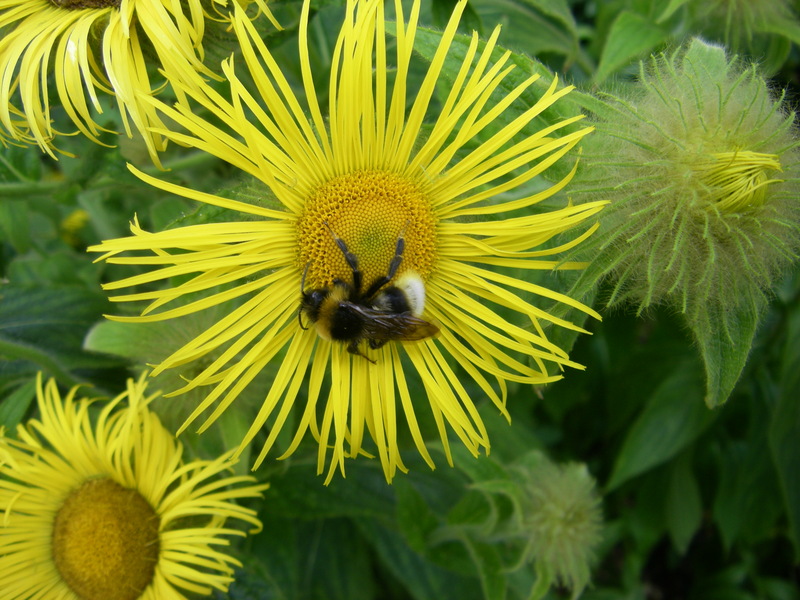 If you are lucky your orchard could be home to: the Noble chafer (Gnorimus nobilis),Bumble bees (Bombus) leaf cutter bees and other wild and solitary bees. Wasps, hornets (vespa crabro) and hover flies, many Butterflies, Mistletoe Weevil (Ixapion variegatum), Mistletoe bug (Anthocoris visci), Red-belted clearwing moth (Synanthedon myopaeformis), Eyed Hawk-moth (Smerinthus ocellata), Pinion-spotted Pug (Eupithecia insigniata), Lunar-spotted Pinion (Cosmia pyralina), Beautiful Hook-tip (Laspeyria flexula). Bullfinch (Pyrrhula pyrrhulla), Song Thrush (Tardus philomelos), Mistle Thrush (Tardus viscivorus), Wood Pigeon (columba palumbus) , Linnet(Carduelis cannabina), Spotted flycatycher (Muscicapa striata),Tree creeper (Certhia familiaris), Nuthatch (Sitta europaea), Tree Sparrow (Passer montanus), Owls, Woodpeckers (eg: Green woodpecker/Picus viridus), Turtle dove (Streptopelia turtur), Fieldfare (Turdus pilaris),Redwing (Tardus iliacus),Brown Hare (Lepus europaeus),Hedgehog: (Erinaceus europaeus),Bats,Wood mouse( Apodemus sylvaticus), hedgehog, Common toad (Bufo bufo) and if you have a pond,fish, frogs ans newts including the Great crested newt (Triturus cristatus) and Grass snake (Natrix natrix). You may have a Wild crab apple Malus ssp with Mistletoe (Viscum album), Lichen (Parmelia acetabulum), mosses, Ivy (Hedera helix) and tree fungi; a grass sward with Wild daffodil (Narcissus pseudonarcissus), primrose (Primula vulgaris) or cowslip (Primula veris). If you have a hedge look out for violets, jack by the hedge and stitchwort.